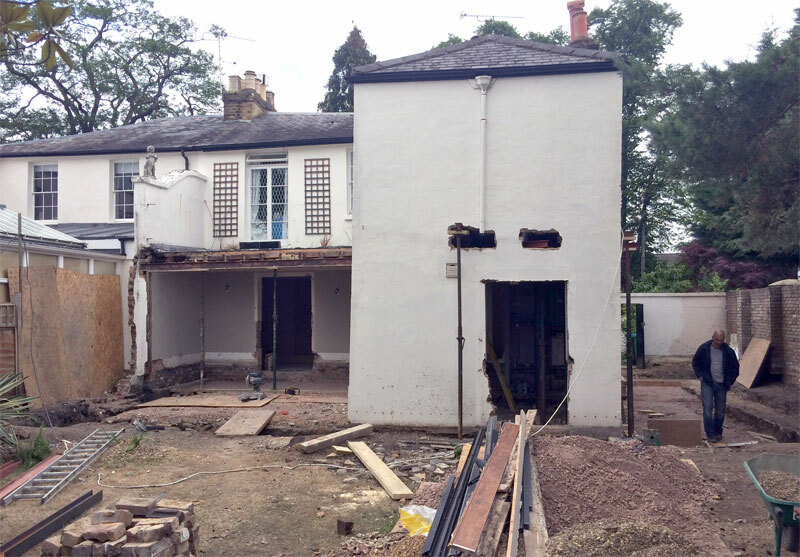 Demolition work has commenced on RRA’s house refurbishment and extension project in Twickenham. The house is a Building of Townscape Merit in a Conservation Area and Richmond Council passed plans without any problems. The scheme includes extensive internal remodeling with two new en-suite bathrooms being added and a newly designed main staircase. 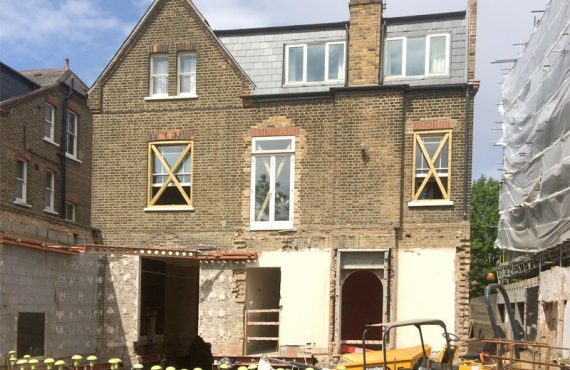 A glass infill extension (to the left of the photograph) will create a new garden-room for the family, linked to a new kitchen and the living room. The room will have full-width doors and a long rooflight, giving maximum daylight deep into the house. The flat roof will be softened by the addition of a sedum green roof supplied by Sky Gardens. 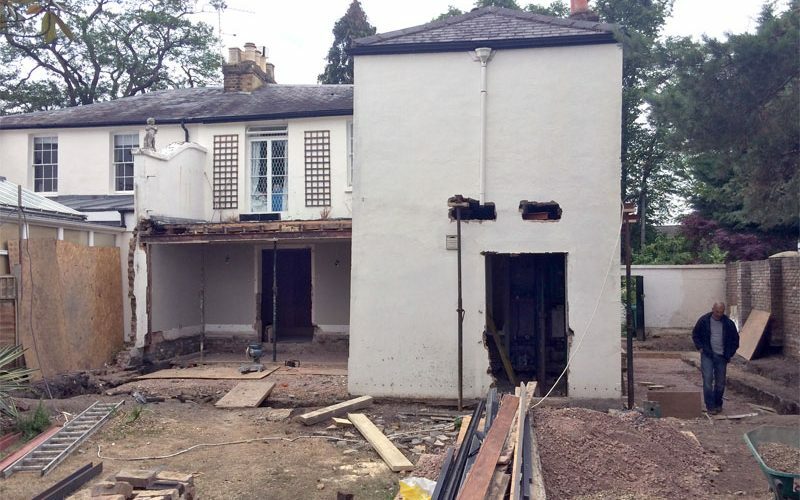 A large side extension (to the right of the photograph) will provide a new kitchen, dining area, utility room and study. One of our clients has retrained from being an anesthetist to a fine maker and decorator of cakes and the kitchen, utility area and study are designed to be able to be used for this purpose. An important part of the management of this project is to ensure the health and safety of the clients who are in occupation during the works. Detailed discussions were had with the builder and clients to guarantee that they could remain in the house during the works without adding significant time and cost to the project. An additional part of the scheme is the rebuilding of the detached garage to allow for more practical use than currently exists. 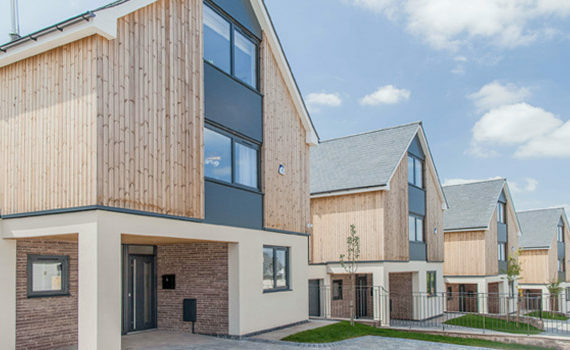 RRA tendered the project and, with Collabora Consulting, finally negotiated the best deal for the client with Robert Baldach Property Development Limited. We have worked on several successful projects with this team and are looking forward to yet more happy clients. The project will be complete in December this year.